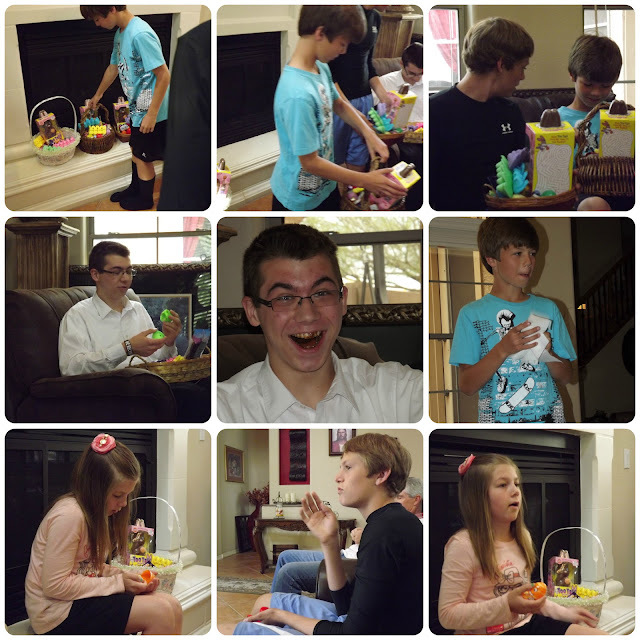 A little late in posting this, but seriously, our Easter was so fun, I wanted to share ANYWAY. I got a few of the Easter decorations up. On Easter day. Last minute I thought it would be fun to spruce up our dining tables for our lovely big family dinner. SIDENOTE: Best/Worst thing about the candy. that doesn't seem to translate to the PC. Maddie got the boys goin' on dying eggs the day before. That girl is a future crafter! She's always wanting to do some project or other. Remember the Attributes of Christ basket? It was unintentional that REVERENT was the word of the day chosen for Easter. Ahhhh, the joy and anticipation of those Easter baskets waiting downstairs! And there they are, in all of their simplicity. That's the least ever in our household on Easter morning! This year the baskets had candy only. Previously Easter for us has been almost like Christmas. Baskets filled with toys, money, gift cards, etc. But I just could not get into that this year. The kids weren't into all that either. (I had warned them ahead of time). I actually almost forgot to even buy the candy. LOL! See how much they are enjoying their candy?! Ohhh I love these guys!!! Nothing can gross you out on Easter morning better than a big CHOCOLATE SMILE, huh?! Another pic from a phone app that didn't translate to the PC. wearing her pretty and modest Easter dress that she chose herself. Our son Chris and his family came over for dinner and activities. Cowboy has really been knocking it out of the park with his marinades and smoked meats! Chris and Brooke make CUTE babies! Here's baby Layton looking out the window. but this time next year he'll be running around in the yard hunting for eggs with the big kids. for our 3 grandkids Abigail, Craig and Laney. Maddie was a finder-helper for the little kids. 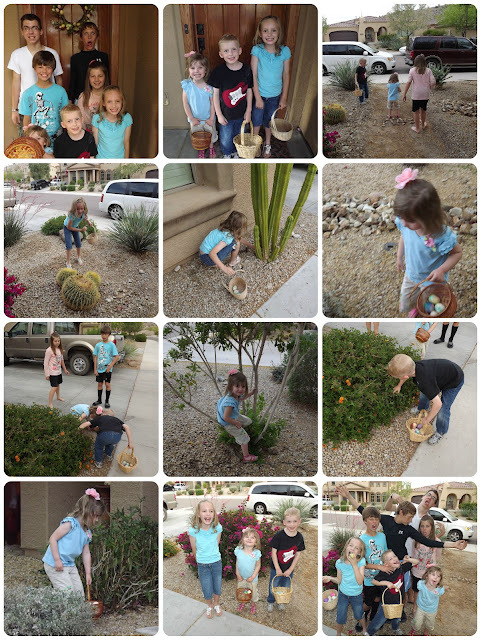 It was an awesome coincidence that the kids each found the same number of eggs! Funny story, I was positive that the boys had hidden 36 eggs.....a nice round three dozen. The kids could only find 30 eggs. Finally I got a brain and checked the packaging of the cardboard egg flat. See the rocks layed out on the path on the right? It spells Laney. The big kids LOVE that little Laney! and she really wanted to make some. I taught her and Regan how to blow out eggs. and stuffed the ends with tissue paper. That first picture was taken with my phone looking down into the egg. and ended up with a nice basket of them. and she cracked her egg on my head FIRST. You can see I was scared! LOL. Oh hey, the dog wanted some confetti too! We put a big tarp in the backyard to catch all the confetti. Last thing our pool filter needs is getting clogged with all that mess. haha. SUPER FUN and everyone wants to do it again next year! What a wonderful Easter our family had! I hope yours did too!!! I only teach on Sunday's about every four months. I talked about events leading up to the ATONEMENT and the ATONEMENT itself. Sister Gable spoke about the RESURRECTION. And I love Sugardoodle where I found this wonderful object lesson. 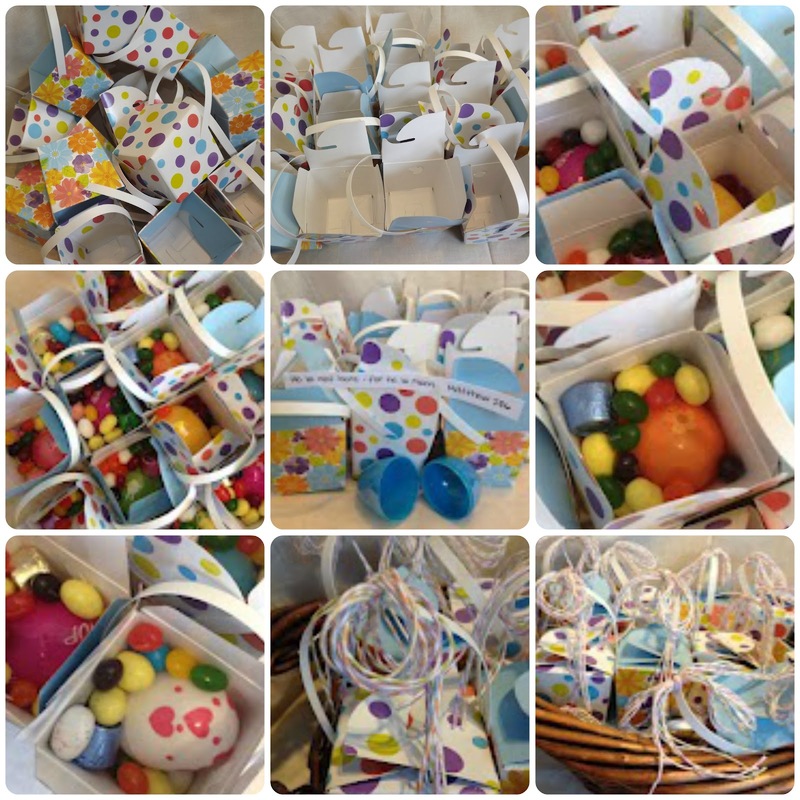 12 plastic eggs, each filled with an object and a scripture. and sharing what the object and meaning was. The twelfth egg was empty. As it says in Matthew 28:6, "He is not here, for He is risen". Even if you never intend to use this object lesson, check it out. to the Savior leading up to that first Easter morning. The Savior died for us and we can use the Atonement in our own lives everyday. Here is the handout I gave each of the Young Women. I am so grateful for our two children who are serving full time missions right now! They teach of the Savior and His Atonement every single day! Love the post. It was so fun to relive the day. We love you all. So glad we are family! I am so glad we are family too, Brooke! 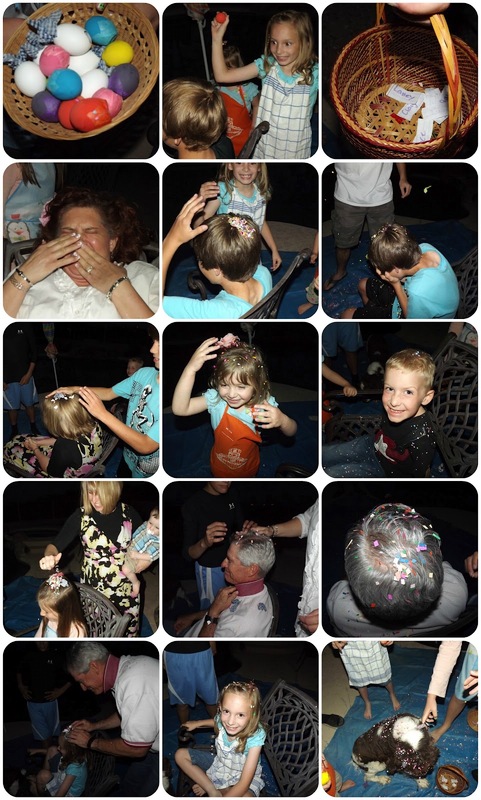 We have seriously good times when you and your family are here! Love you!! !